President Donald Trump waves as he boards Air Force One for a trip to visit areas impacted by the California wildfires, Nov. 17, 2018, at Andrews Air Force Base, Md. President Donald Trump surveyed the devastation from the California wildfires on Saturday, touring a neighborhood in badly ravaged Paradise and another in Malibu, where the homes were reduced entirely to rubble. “This is very sad to see,” Trump said as he stood with the governor, the mayor of Paradise and other local officials on a destroyed street. "As far as the lives are concerned, nobody knows quite yet." “As big as they look on the tube you don’t see what’s going on until you come here,” Trump said of the scale of the destruction and the impact of seeing the damage in first person. “Nobody would have ever thought this could have happened,” Trump said, as he pledged the full support of the federal government in the recovery efforts. 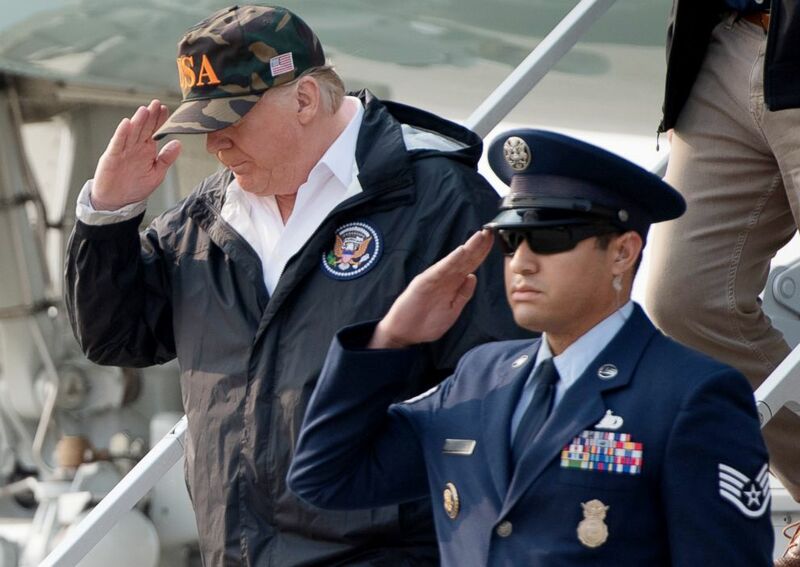 President Donald Trump arrives at Beale Air Force Base in California, Nov. 17, 2018, as he travels to view wildfire damage. Asked if seeing the destruction has changed his perspective on climate change, the president said it had not, and instead repeatedly pointed to forest management as a key factor in fire prevention moving forward. During a meeting with fire and local officials at an incident command center in Chico, the president referred to the fire as a "monster" and applauded firefighters who are “fighting like hell” to put out the remaining parts of the fires still burning. 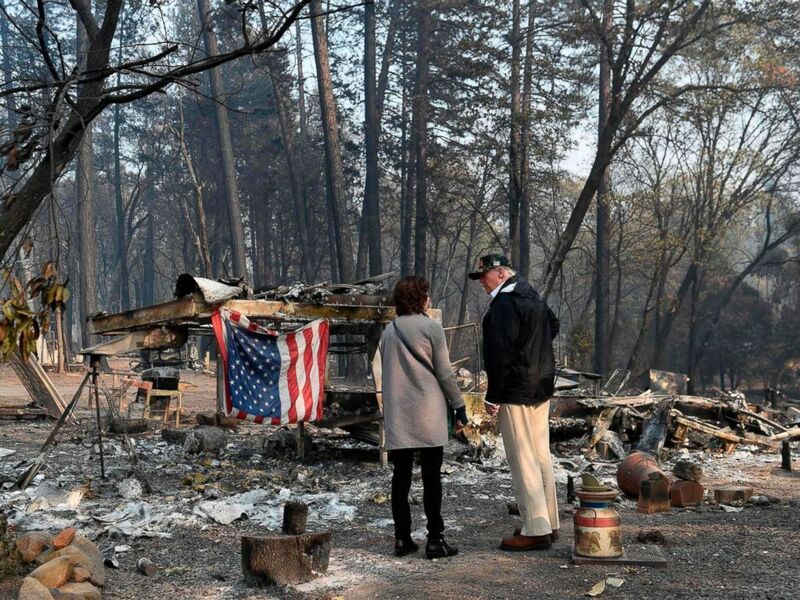 President Donald Trump views damage from wildfires in Paradise, Calif., Nov. 17, 2018. The raging wildfires have already claimed at least 79 lives and up to 1,000 people are still missing. 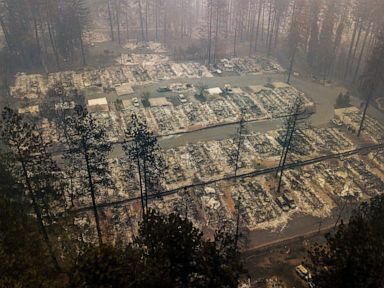 The Camp Fire in Butte County, which killed at least 71 people, is considered the deadliest and most destructive wildfire in the state's history. When the president arrived in California beneath hazy, smoke-filled skies Saturday, he was greeted by FEMA Director Brock Long, Gov. Jerry Brown and the governor-elect, Gavin Newsom. In a tweet, Brown, who has feuded with Trump on several issues, welcomed the president to his state. "Tomorrow @GavinNewsom and I will join @POTUS during his visit to the state," he tweeted Friday. "Now is a time to pull together for the people of California." The president also received derision on social media when he appeared in Malibu, after his tour of Paradise, and he referred to the town as "Pleasure." Trump said he’ll be stopping at two of the most devastated areas, and applauded the firefighters for being “unbelievably brave” as they’ve battled the fires. The president also reiterated his criticism -- which first appeared as a tweet -- that poor fire management is to blame for the severity of the fires, and pointed to Finland as an example of how to better maintain forests. Trump added that it could have been "a lot different situation" if we had been talking about forest management earlier. "It should have been done many years ago but I think everybody is on the right side. It’s a big issue,” he said. 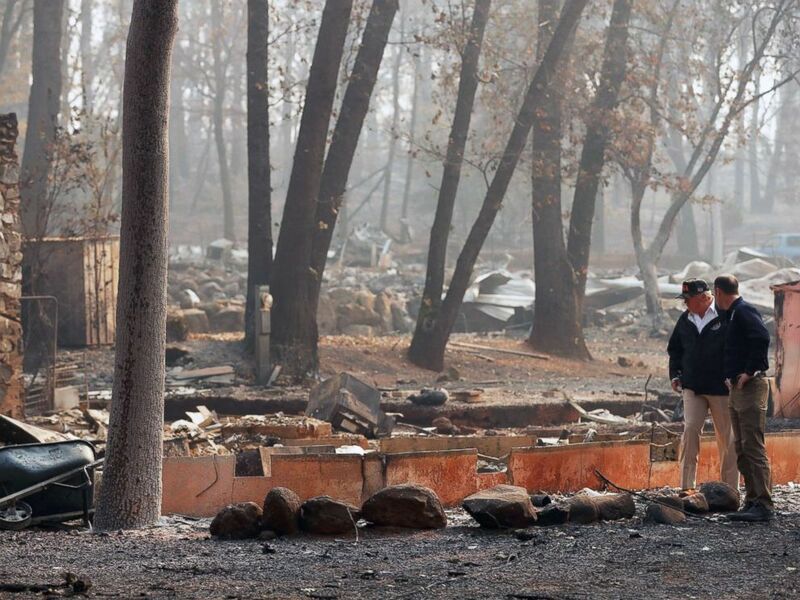 President Donald Trump visits the charred wreckage of Skyway Villa Mobile Home and RV Park with FEMA head Brock Long, right, in Paradise, Calif., Nov. 17, 2018.